The ladder cable tray: Tray must have an inside available width equal to or greater than the sum of the diameters of the cables, which installed in a single layer. Solid bottom cable tray: the sum of the cable diameters is not to exceed 90% of the available cable tray width. Ladder Type Cable Tray: The total sum of the cross-sectional areas of all the cables to be installed in the cable tray must be equal to or less than the allowable cable area for the tray width, as per following Table. Solid Bottom Cable Tray: The allowable cable area is reduced by 22%. Ladder Type Cable Tray: The ladder cable tray needs to be divided into two zones (a barrier or divider is not required but one can be used if desired) so that the No. 4/0 and larger cables have a dedicated zone, as they are to be placed in a single layer. A direct method to determine the correct cable tray width is to figure the cable tray widths required for each of the cable combinations per steps (2) & (3). Then add the widths in order to select the proper cable tray width. Ladder Type Cable Tray: A ladder cable tray containing only control and/or signal cables may have 50% of its total available cable area filled with cable. Solid Bottom Cable Tray: When using solid bottom cable tray, the allowable cable area is reduced from 50% to 40%. All single conductor cables to be installed in the cable tray must be larger than 1/0 AWG (53.5 Sq.mm) and not to be installed with Solid Cable Tray. 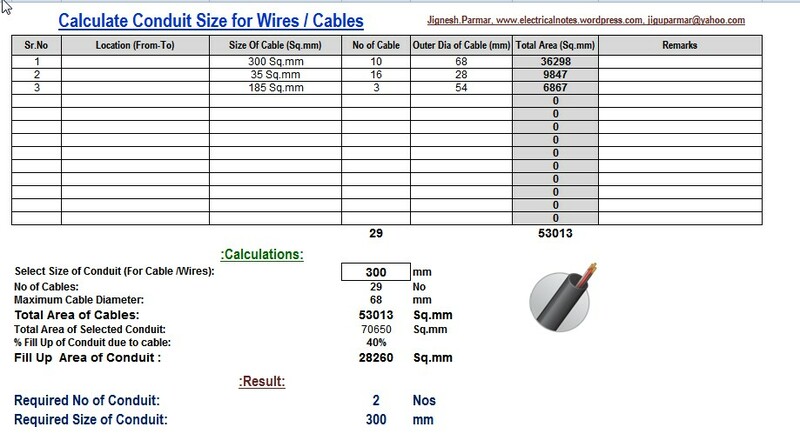 The sum of the diameters (Sd) for all single conductor cables to be installed shall not exceed the cable tray width as per following Table. These single conductors must be installed in a single layer. To avoid these potential problems due to unbalanced voltages, the individual conductors for this type of cable tray wiring system should be bundled with ties. The bundle should contain all of the three phase conductors with the neutral if used. The sum of the diameters of all cables rated 2001 volts or over, is not to exceed the cable tray width. Barrier is used to separate cable systems, when Single Core cables of above and below 600 volts installed in the same cable tray. But when Multi Core type cables over 600 volts are installed in the same cable tray with cables rated 600 volts or less, no barriers are required. The barriers should be made of the same material as the cable tray and height must equal to the depth of the cable tray.